All Regional P.F. Commissioner (In-charges of Regional Offices). Sub: Prevention of frauds in Pension payments ~ regarding. (i) Rotation policy of staff may be followed. The maximum tenure of three years may be followed in all Regional Offices without any exceptions. Records of charge allocation including deputing special messengers’ alongwith CD/BRS to the bank should be maintained and periodically verified by officer In-charge concerned. (ii) Credit statement of uploaded data is being provided by the bank to the concerned EPFO office for reconciliation within a day. PPO wise reconciliation may be done by the system itself. The activity of reconciliation may be carried out under the supervision of RPFC induding credit in EPFO’s A/c No. 10 of undisbursed account. 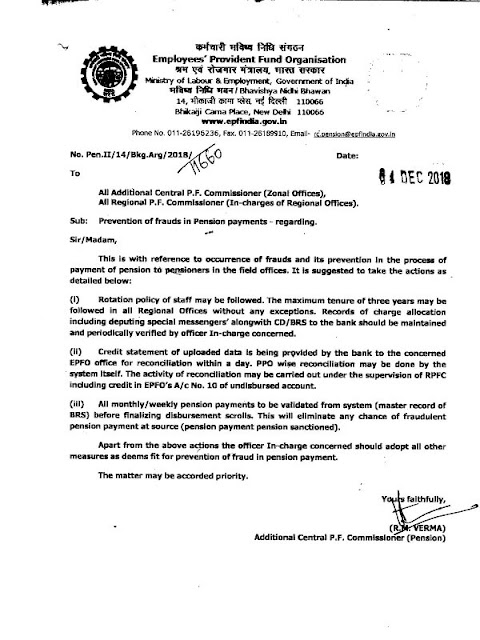 (iii) All monthly/weekly pension payments to be validated from system (master-record of BRS) before finalizing disbursement scrolls. This will eliminate any chance of fraudulent pension payment at source (pension payment pension sanctioned). 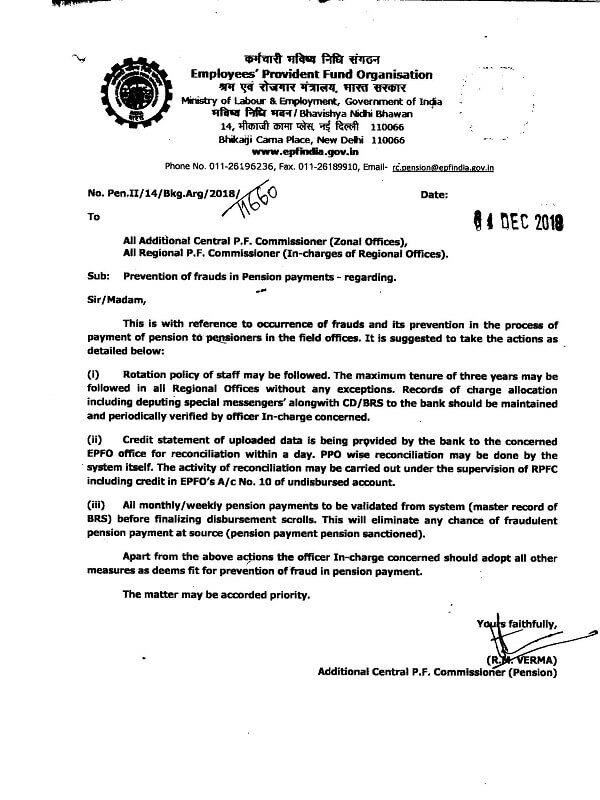 Apart from the above actions the officer In-charge concerned should adopt all other measures as deems fit for prevention of fraud in pension payment. The matter may be accorded priority.